Need to get in touch? Check out our Contact us page to make an enquiry with a member of our team. The Lin Marsh Store’s payment provider partner is Secure Hosting. 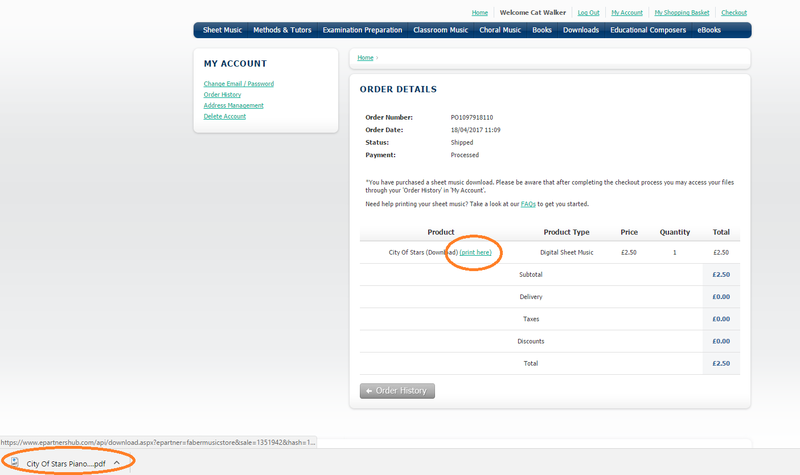 Following any processed order on the website you will receive email confirmation that the transaction has gone through and an Order Notification summary email receipt from Faber Music, who host the store on our behalf. Please quote your PO number in any correspondence with the customer support team in order that we may help you with your query as quickly as possible. We accept all major debit and credit cards with the exception of Laser and Amex. We do not currently offer PayPal as a payment option. A card is required for all online transactions. You don’t need to include an issue number unless you are using a Switch, Maestro or Solo debit card, or a start date if this information is not included on your card but please ensure you always enter an expiry date. If you receive a “Transaction denied: card declined” message this is likely to be because some card-issuers are very strict with online card payments and if you don't make purchases on this website very often they may be inclined to refuse the transaction, even if there are enough funds in your account to pay for your order. This is more likely to happen if you are based outside of the UK. If you have checked your card details and they are all correct, we suggest that you contact your card-issuer and ask them to authorise the transaction from our website and then try to complete your order once again. Alternatively, try using a different credit card to complete the transaction. It is our e-commerce policy never to capture or store any bank card details belonging to our customers within our own systems: all transactions that take place on our website are handled by our payment provider www.securehosting.com. Should you have any queries relating to online payments from the store that are not covered in these FAQs, we would encourage you to contact Secure Hosting on +44 (0)845 269 6645 or info@securehosting.com - quoting your Transaction Reference Number in any communication with them. Orders are picked on the day of receipt (during office hours: Monday-Friday, 9.00am-5.00pm GMT, excluding Bank Holidays) and shipped by Royal Mail First Class post. Once the item has left our distribution warehouse it is in the hands of Royal Mail. Currently we are unable to track orders so if you do not receive it within these timeframes or you miss delivery of your order please check with your local sorting office to see if they have the item. If they do not have it then email support@fabermusic.com, quoting your order PO number and we will investigate further. Can I combine shipping on 2 orders or add to my existing order? Unfortunately, once an order has been received and processed, you cannot combine shipping or add to it afterwards. In the event of an order being supplied incorrectly, or if you receive it damaged, please contact our Customer Services Team on +44 (0) 1279 828988 or email support@fabermusic.com stating your PO number so that we can authorise its return to us. Goods returned in this way should be clearly marked "Authorised Return". We will send you either a replacement copy or provide you with a full refund and cover the cost of the return postage. If you require an invoice please print your Order Confirmation email. If you require a VAT invoice please contact support@fabermusic.com, quoting your PO number and we will organise this as soon as possible. Can I see a summary of my order online? Yes, log into My Account and check your Order History. Here you will see a summary of items in your order. Unfortunately some of the content on the web store is restricted in certain territories due to copyright reasons so you may not be able to complete your transaction if this is the case. Territorial restrictions are usually stated on the product page or you will be notified at the checkout. Why do you need my address details? Our sheet music files are delivered in PDF format and can be accessed through your ‘Order History’ in ‘My Account’. They can be downloaded and saved to your computer and you are permitted to make 1 print out of the file, or the number of copies specified in your corresponding choral licence. Audio files are in MP3 format and can be accessed through your ‘Order History’ in ‘My Account’. They can be downloaded and saved to your computer. Files are for personal use only and photocopying or digital distribution of any kind without a licence is prohibited. How do I find my purchased products? 4. Click on relevant PO number in the order listing. 5. If you’ve bought digital goods you can print or download by clicking on the link to Print here or MP3 Download, next to the song title. How do I print my sheet music? To print your sheet music, click on the link to “Print here” next to the song title in your Order Details. Click on the file to open it, once it has finished downloading. You can print it immediately from the browser or save it to your device. We would recommend printing from a PC or laptop rather than a tablet device. PDF files are set to our standard printing specification which is about 95% of the original page size to ensure that all the copyright information fits on the page. When printing the sheet music the browser normally uses a default setting that adds additional margins, headers and footers to the page. When you come to print you should ensure that any options for headers and footers are deselected and that fields for margins are set to ‘minimum’ where possible.Please try re-printing your purchase with these fields deselected. If you are not satisfied with the print quality of your order please contact the Digital team on epartners@fabermusic.com, quoting you PO Number. Can I transpose my sheet music? Unfortunately this is not currently possible with the digital sheet music delivery technology used on our platform. We strive to ensure all our sheet music is accurate and of the highest quality. If you are not happy with your sheet music please contact epartners@fabermusic.com, quoting you PO Number and we will respond as soon as possible. Trying to download audio files to mobile/tablets? Audio files will not download directly onto mobile phones or tablet devices. You'll need to download them to your PC or laptop, add them to your audio player and sync it with your various devices. Orders can be accessed from any computer when signed into Your Account. Click on your Order History for all available orders within the 7-day printing/downloading window. How do I delete/unregister my account? Customers must register their details with us in order to make a purchase from this website. If, at any point, you wish to un-register and remove your details from our database then please log into My Account, click on “Un-register” and follow the instructions on the page.